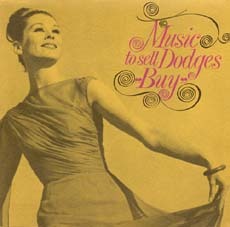 Cover of "Music to Sell Dodges Buy,"
the '64 Dodge 50th Anniv. 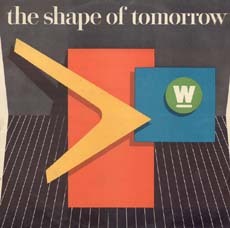 show Cover of "the shape of tomorrow,"
In 1963, the Xerox Corporation was the Cinderella story of the business world. When they introduced their weighty 914 copier in 1959, they had the ability to produce only 5 models a day, and costs were in the tens of thousands. Few thought that a bulky slab of metal like the 914 would perform well at all, much less revolutionize the copy business. Lucky for Xerox, the critics were wrong. In fact, they were way off. The 914 became known as the most successful product in history, doubling and tripling Xerox's sales figures over the next several years. In 1961, Xerox sales had reached 61 million. In 1962, they hit 104 million - far more than company president J.C. Wilson could ever have imagined. In 1963, Xerox was poised to introduce their first desktop copier - the 813. Since Wilson had flown his entire inner-circle of managers and salesmen to London the previous year to celebrate the 100 million mark, he wanted to try something different this year. Something rewarding, something that Xerox employees would remember forever. This album has been prepared so that we will never forget a happy occasion of great significance to Xerox - the introduction of the 813. Yes, Xerox made a musical about their company, something that in fact had been done many times before, by all types of corporations, though few would know it today. These records had absurdly limited private pressings, and they were given to employees only, never for public consumption. This elusive and almost completely unknown genre, known as the "industrial musical" or "industrial show", is one of the strangest and complicated types of music that has existed. It's not advertising music, nor is it quite Broadway. It's propaganda, yet it's also fun. It puts the listener in an odd place, as you are privy to the intimate dreams and the visions not of say, Tony and Maria, the doomed teen hero and heroine of West Side Story - but of U.S. Steel, or General Electric, or Maremont Mufflers. Yet it's with the same fervor that these lost records resonate. The coiled feelings of hope, industry and greed, coupled with a happy Broadway bounce and a joyous corporate cheerleading squad, singing anthem after anthem to boost the coming prosperity. Who's copy business is all that they claim? Why Xerox! Xerox! Xerox's the name! Why be the low man and spread yourself thin? Xerox! Xerox! Xerox's the name! Ford has done it again! And they'll buy, by golly, they'll buy! And beat the hell out of Chevrolet! Gonna be a golden harvest in 1959! Gonna have a lot more buyers in 1959! By the late-fifties, these deliriously happy anthems began having a positive effect on the country's workforces - at least for the night or two that they lasted. Large companies like Chevrolet wouldn't blink an eye to literally spend millions on a gala event like an introductory show. As with Ford's '59 tractor show, budding composers would often jump at the chance of composing an industrial as the pay was outrageously good. So would budding talent. For instance, Florence Henderson starred in an Oldsmobile industrial show almost every single year in the fifties - and many of these shows were hosted at a Broadway theater. The pressing of an album to commemorate the event was relatively cheap compared to the costs of throwing the gala - perhaps the companies innately understood that the souvenir record would in many cases sit on the shelf only to be discarded at the thrift store or the dump years later, that indeed the uplifting feelings would be ephemeral, that the record would remain a "souvenir". It was the spirit of the moment that brought the workers together. "Today was the most beautiful day of my life!" A few short years ago. The Xerox that we know. Is a dream that we made come true! A mighty future to pursue! Said we can make it go! This dream of destiny is destined to GROW AND GROW!!! Unyielding corporate loyalty wasn't the only musical mainstay that came out of the fifties industrial shows. By the late-fifties, industrial shows had moved slightly beyond the auto and retail industries and had spread to other areas of American production. Standard Oil released The Big Change in 1957 and Westinghouse Appliances released a brilliant record called the shape of tomorrow: a musical introduction to 1958 Westinghouse Appliances. This record, slathered with gusto, represents the beginning of what makes some industrials truly transcend the genre into special listening: the unabashed commitment to cram every single detail about a seemingly random piece of equipment, fixture or appliance into a three-minute song - and do it with reasonable panache, spirit and honesty. This was sinister and joyous, it dares a listener today to take it seriously. To bring colder temperatures to all the foods there! And here on the front is a magnetic door! This is the shape of tomorrow, that we've got right here for you today! Far from sounding like a commercial, it's meant to educate the listener, which in this case would be a salesman. It's meant to excite him, to motivate him with facts and figures that he in turn can dole out to easily persuaded housewives and cowed husbands who don't yet realize that they need a cheese-server. The customer is lovingly seen as a wallet with a mouth that the members of the mammoth conglomerate need to pay attention to - against the well-arranged punches of a hip brass section. the shape of tomorrow is meant to bring the excitement back into owning ranges, or an icebox. It fueled the excitement of consumption in general. Indeed, the motivational forces and the instructional forces, coupled with the best talent in musical theater would lead the industrial musical into its most fruitful twenty years. Packaging and pricing - a pair of pliers? Pliers to get a grip on profit - profit for the business, yessiree! IBM, J.C. Penney's, Dupont and GE all released multiple musicals during this period as did many smaller companies. Not all budgets were high, it just seemed like most medium to large-sized companies thought putting on an industrial show was a great idea. Some shows, like the two by GAF Floor Products, were just a piano and a few singers recorded in a hotel suite. For the larger corporations the budgets remained high, but the souvenir albums often had gatefold covers and programs. For instance, included in the Woolworth's 1965 show Mr. Woolworth Had A Notion was an 8-page booklet that listed cast biographies and the cost of each individual piece of clothing the cast was wearing - just in case you wanted to know the price of a "white mohair blend shell with a little girl collar and ruffled detail." And the music got better. Perhaps it's because of the budgets, or perhaps it was just their tireless efforts, but some great songwriters worked in industrials during these years, gradually building a reputation as the industrial "Wrecking Crew" as it were. Michael Brown, a veteran of Broadway, had a knack with tricky wordplay in his numerous shows for Penny's, Dupont, Belk's, Holiday Magazine, Woolworth's and Singer, to name a few. Hank Beebe and Bill Heyer wrote a slew of wonderfully crafted shows with catchy compositions - Diesel Dazzle, for the Detroit Diesel Engine division of GM, The Seagram Distillers Distributors Meeting in '65, Going Great for Rambler in '64, and perhaps their crowning achievement, Got To Investigate Silicones, the 1973 show by G.E. 's Silicone Products division. Lloyd Norlin continued to write through this period, Sonny Kippe wrote two wonderful shows for Monroe Calculator and one for Royal Typewriters. Skip Redwine's four shows for York Air Conditioners quite simply, rock. These composers succeeded because they took time with their medium, even though it was clear the main reason they were in this game was the money. Not all of the material is completely straight-faced, in fact, much of it is pretty funny, even with it's underlying themes of "doing what's best for the company." Steve Young has chronicled many of these composers invisible industrial work and says "The best composers weren't cynical about it. They took pride in doing their best work all the time. Once I got past the initial hilarity of the subject matter, I realized there was a lot of fine work being done." In it for the money as well was Hal Linden, who appeared in the 1965 New York Herald Tribune musical The Saga of the Dingbat, as well as Diesel Dazzle, as did David Hartman. Hartman also joined Loretta Swit in Listerine's 1964 show The Name of the Game. Valerie Harper made an appearance in General Electric's Go Fly A Kite, their 1966 double-album industrial written by none other than songwriting team Kander and Ebb, who would later write Cabaret and Kiss of the Spider Woman. Even electronic music pioneer Raymond Scott got into the game by composing A Man Named Brown, a musical for the 100th anniversary of the Brown-Forman Distillers Corporation.